Fed chief Yellen: Oil drop is 'positive' for U.S. 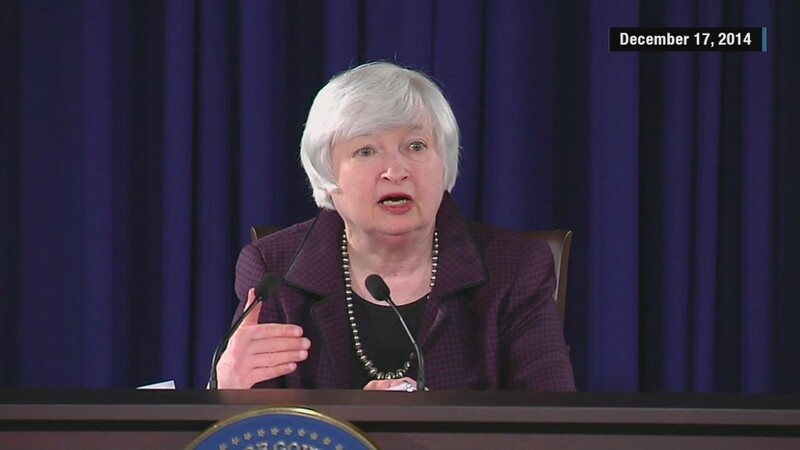 The dramatic plunge in oil prices might be spooking some investors, but Janet Yellen isn't worried at all. The Federal Reserve chief believes oil tumbling below $55 a barrel is like a tax cut for American consumers. "From the standpoint of the U.S. and U.S. outlook, the decline we've seen in oil prices is likely to be, on net, a positive," said Yellen at a press conference on Wednesday. "It's good for families, for households. It's putting more money in their pockets," she said. Thanks to the oil price decline, drivers in at least 13 states around the country can now find gas for cheaper than $2 a gallon. Cheaper energy also translates to lower expenses for many U.S. businesses, especially ones in the transportation industry like airlines. Yellen acknowledged that the plunge in oil prices may cause cutbacks in the drilling industry, which is likely to slow capital spending for wells that aren't profitable in the current environment. However, the Fed chief noted that despite the shale boom, the U.S. is still a net importer of oil. That means cheaper prices are good for the overall economy. "On balance, I would see these developments as a positive," she said. Yellen also alluded to how the energy shakeout is creating shockwaves overseas, especially in Russia where the ruble has plunged. While the Fed is "monitoring potential spillovers" to the U.S. economy from the turmoil in Russia, Yellen said the trade and financial linkages to Moscow are "relatively small."